I (Hedda) completed this renovation in 2015 (before our merge as Avenue Design Studio). I was hired to help renovate a 1890’s townhouse in The Hague from a tired old office building to a beautiful family home. It was a 6-month, full tear-out project on four floors and the end result is still one of my personal favourites; it even includes a separate granny flat / rental apartment on the ground floor. The original period features were brought back and highlighted during the build, and the base we created is truly timeless. 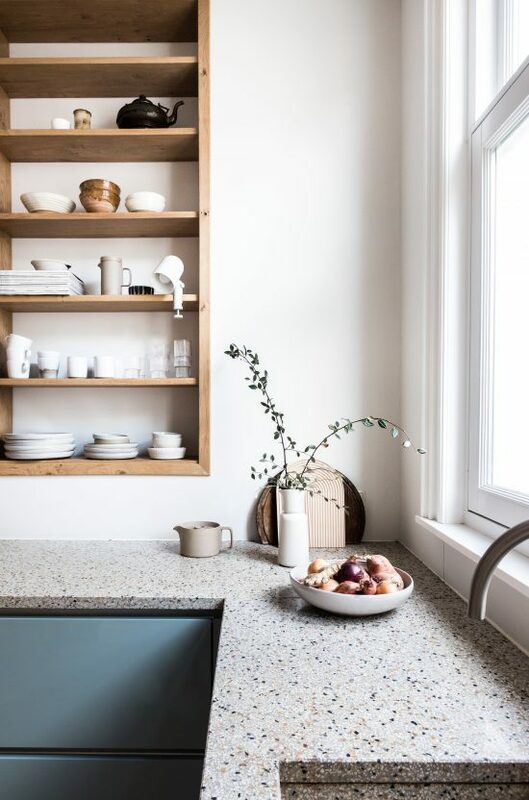 This is illustrated by the gorgeous kitchen featuring a terrazzo worktop with built in terrazzo sink, oak-lined niches creating ceiling-high shelving and a collection of beautiful ceramics, kitchenware, and accessories. 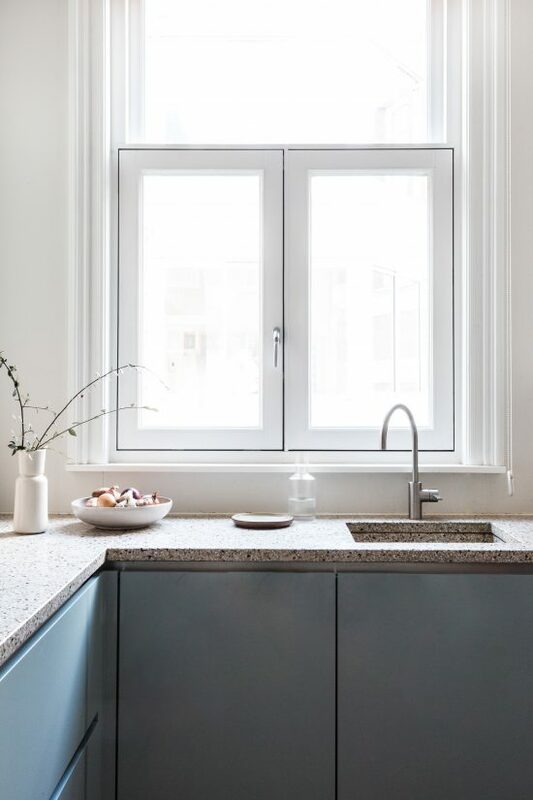 We loved returning to this gorgeous project after so much time has passed to see that it’s just as lovely as it was when it was first installed. 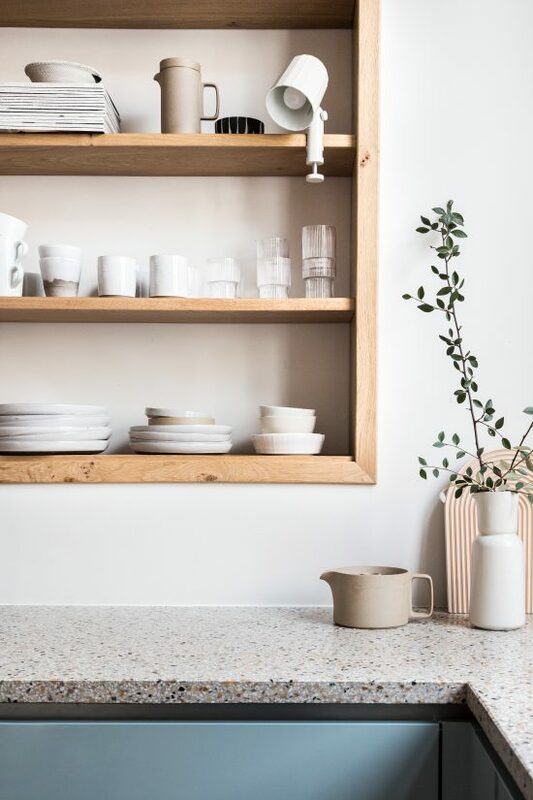 Having completed a lengthy renovation just before the birth of their second child, moving in and surviving was initially higher on the list of priorities for these clients than decorating and styling. But, lucky for us, they came back just before Christmas last year to enlist our help with making their home ‘more cosy’. 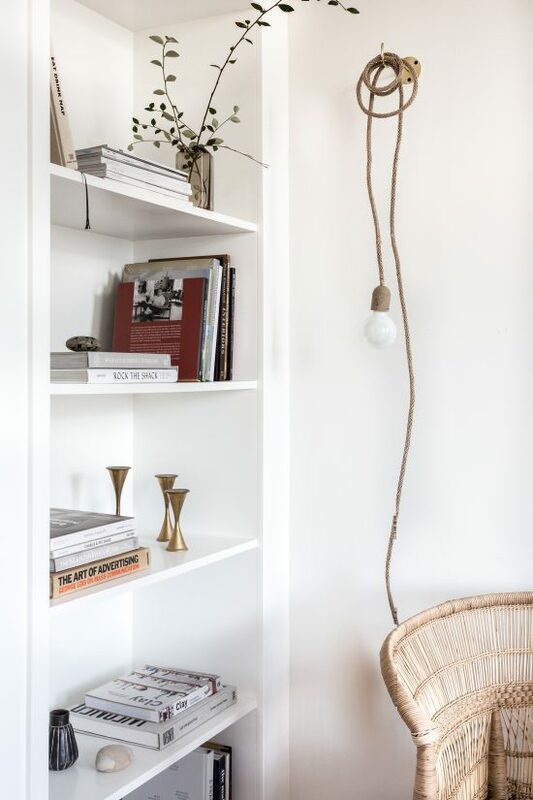 Specifically the brief was: to create better flow in the living area, propose a few key furniture pieces, and update the lighting – which was a mish mash of every lamp they had ever owned since University! They also wanted to see their space in a new light so we gave all of their shelves a makeover while we were at it. As well as bringing in some new pieces, our aim in this installation was to show the client how they could use their existing pieces to their best advantage. 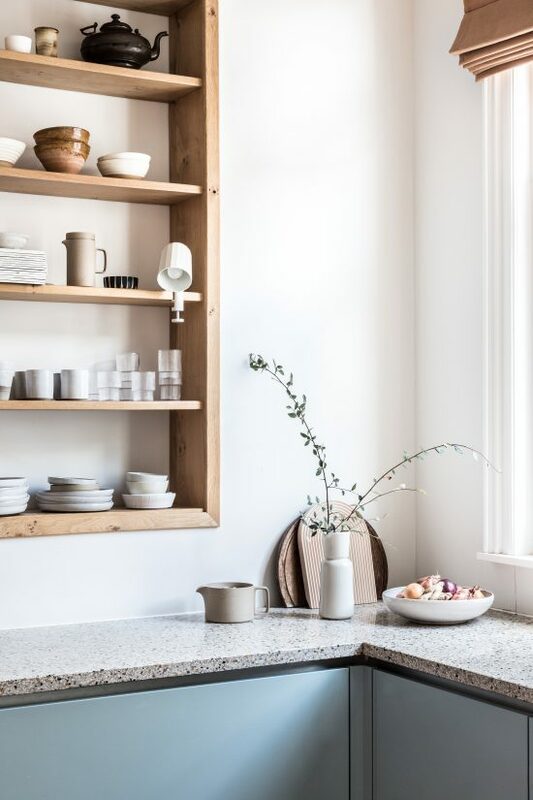 While I set to work getting the lighting installed and the furniture re-shuffled in the living and dining rooms, Holly styled the kitchen shelves and really made them come to life. I’ve never seen them look better! Sometimes it’s just about seeing what you already have, in a new light. Of course we also brought in some pretty accessories to add to the existing mix – that’s kind of one the of the best parts of our job 🙂 We brought in Hasami porcelain, our favourite ribbed glassware from Ferm Living, ceramics by Jessica Joslin and Canvas, an graphic chopping board and task light, both by Hay, to finish off our selfie. 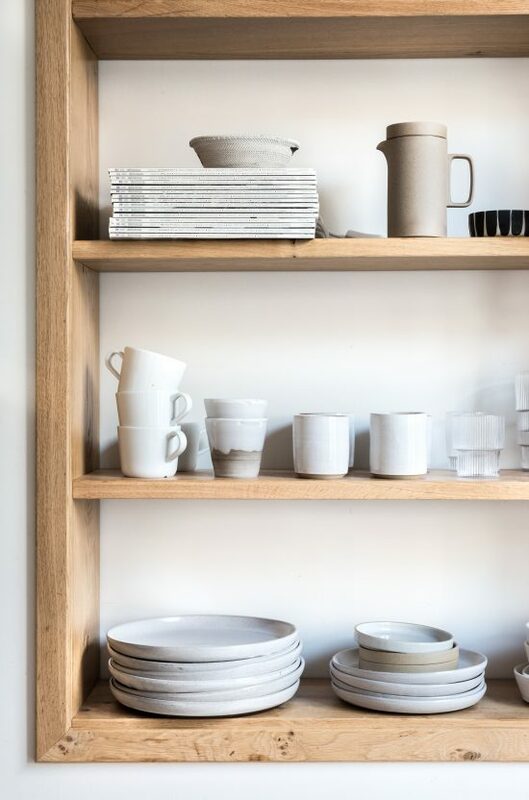 We love seeing every day essentials displayed in a calming way. 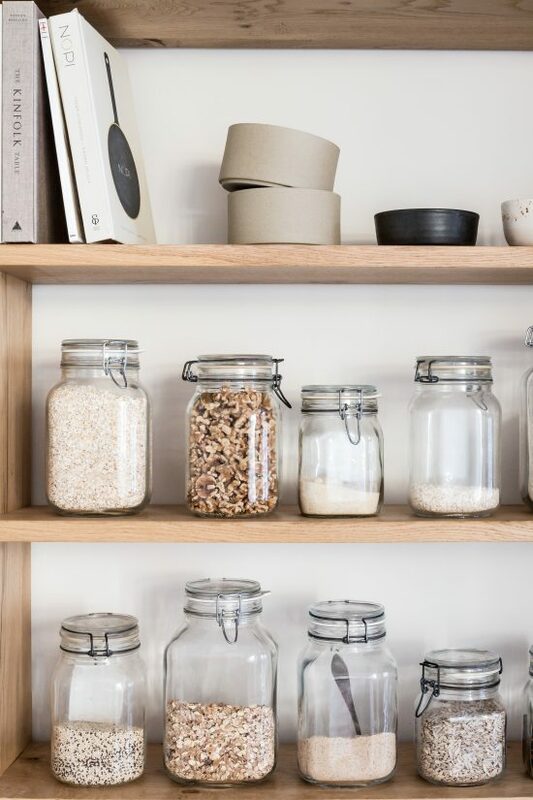 Glass jars filled with nuts and cereals just make a kitchen feel so homely. Beautiful natural light pouring in from a huge window helps too. Meanwhile in the living and dining room, we replaced all the existing light fixtures. 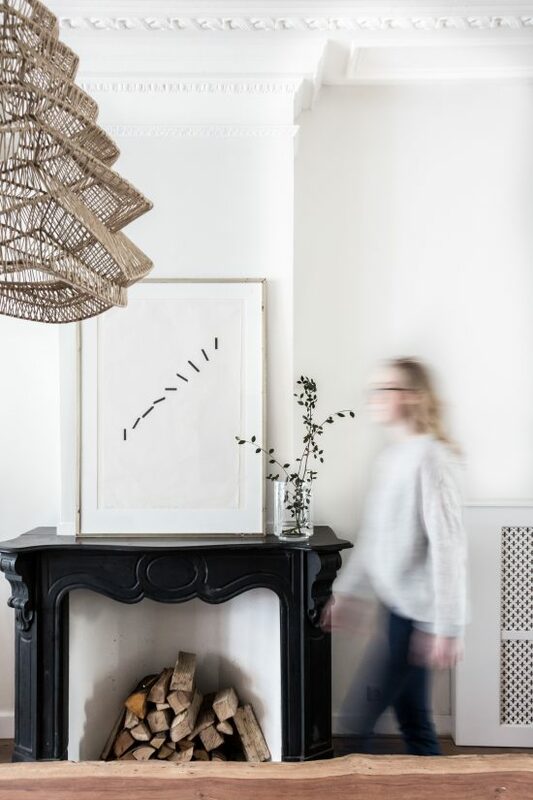 Swedish lighting brand Watt & Veke has a wide range of lamps that are suited to every taste; we brought in various floor and table lamps to scatter around but we particularly loved the ‘Vilda’ lamp for over the dining table. We initially specified one of these but the client liked it so much they got second one. 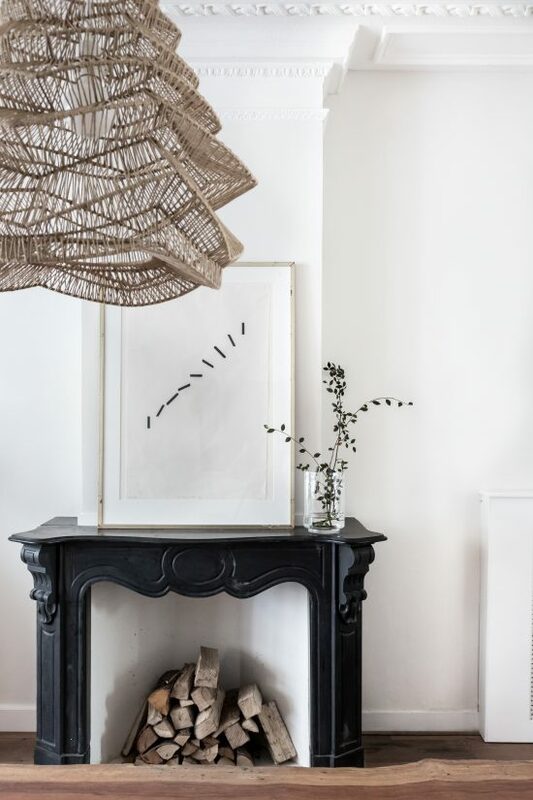 Combined with the gorgeous live-edge dining table that the client already had, cool art from our studio collection and the original black marble fireplace, painstakingly uncovered from under many layers of white paint during the renovation. This styling project was relatively small but it shows how sometimes a bit of reshuffling and some elbow grease can transform a space. Whilst our focus was on replacing all the light fixtures in the living and dining room, we brought in two ‘Malawi’ chairs from our friends at People of the Sun and various other accessories and artworks to create a cohesive whole. We re-upholstered an existing antique chair that they loved but were a bit bored with, edited out several larger pieces of furniture to de-clutter, and moved existing pieces around to different positions. This pretty corner above was a bit of a clutter magnet and now is a serene reading nook. 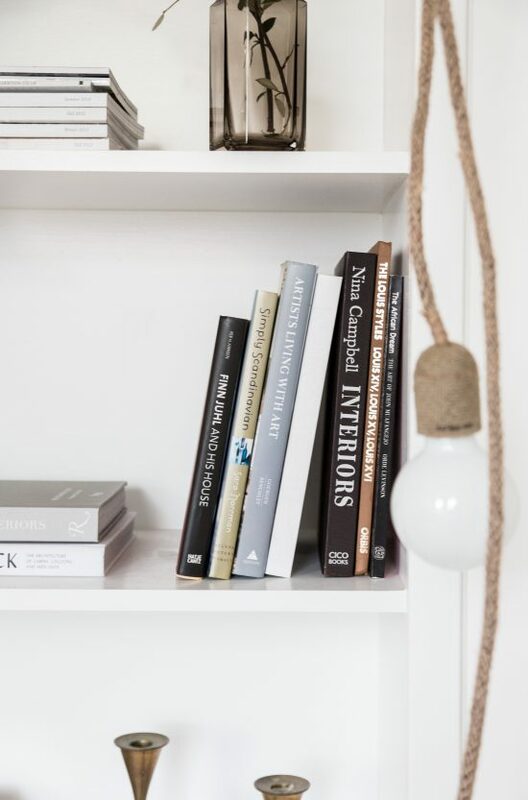 We gave the bookshelves some breathing space and added a few contemporary and interesting pieces (removing an old rocking chair and a Tiffany style lamp that was making the space feel dated). 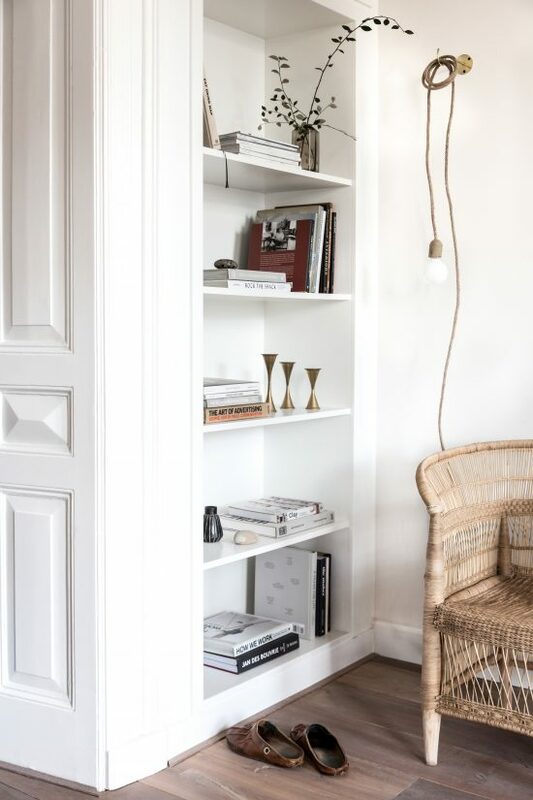 The ‘Jute’ cable lamp and ‘Theo’ brass hook by Watt & Veke combined with one of the ‘Malawi’ chairs give a once tired corner with classic features, a contemporary, textured and fresh new vibe. 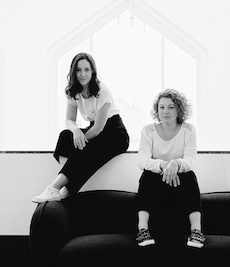 We hope you liked seeing the result of an afternoon installing and styling. 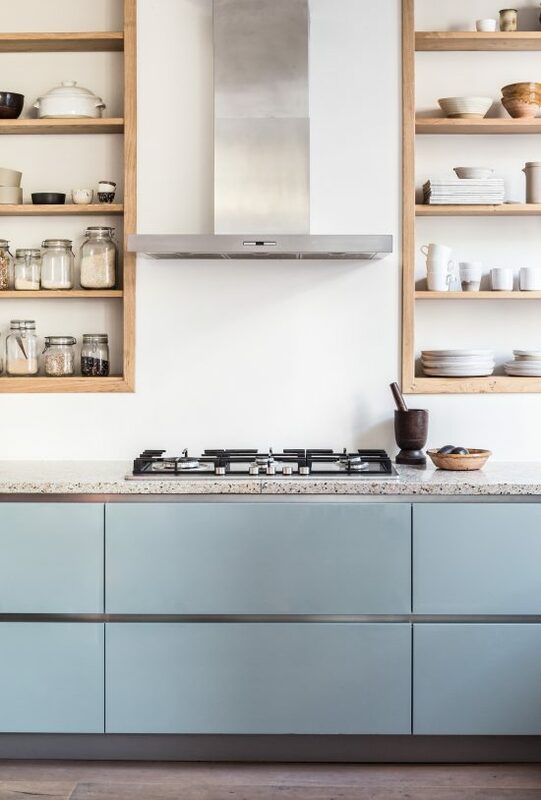 We often work on whole rooms, or complete houses but sometimes it can be really nice to go back to a project you know well, to freshen it up a bit and capture it in a fresh new light. Spot something you love? Let us know in the comments section below! I love e v e r y t h i n g !!! Such a beautiful styling, photoshoot and project!!! This is another beautiful space. Do People of the Sun deliver internationally? Wow it looks very wonderful, the citchen is so great!